We’ve been pushing this update back for a bit to make sure we have everything we need to show it off, and it’s finally here. 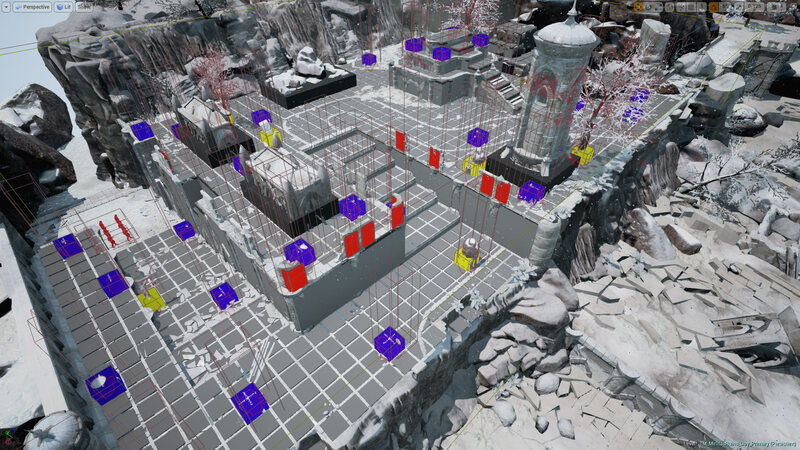 This post showcases once of our larger production maps that will be in Forged of Blood. With all the work that has gone into it, we thought it’d be nice to do a tag-team post again to show how the map goes from one end of the studio to the other. When we started churning out maps for tactical combat in Forged of Blood, the vast majority of them were designed with tactical play in mind. 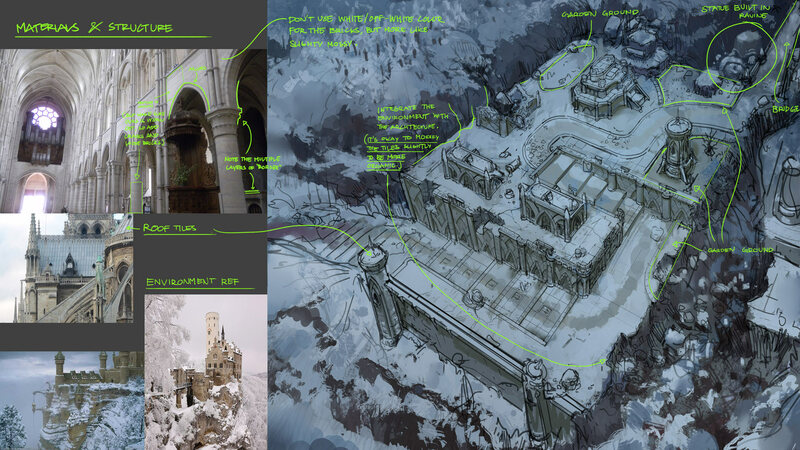 Creating multiple avenues of approach, engagement points, and allowing for creative solutions in approaching the combat has always been at the forefront of our design philosophy, and once the maps are blocked out, they were passed on to the art side for production (see our post by the art team). For the most part, these maps reused assets according to their environment and were designed with multiple uses in mind – these maps would make the large pool of maps we’ve slotted for the many encounters players would have in-game. We did however, reserve a handful of maps for one-off uses that would be lore-specific and today we’ll cover the “Mirlitas Ruins.” Without giving too much away, this tactical map is housed in a section of a vast ancient city where the player will encounter a powerful new enemy – or potentially gain a new ally. With so many little projects going on concurrently, I teamed up with Joe to get the map designed. Going into the design, I had a few story specific objectives that Joe needed to translate into a blocked out map in-engine. 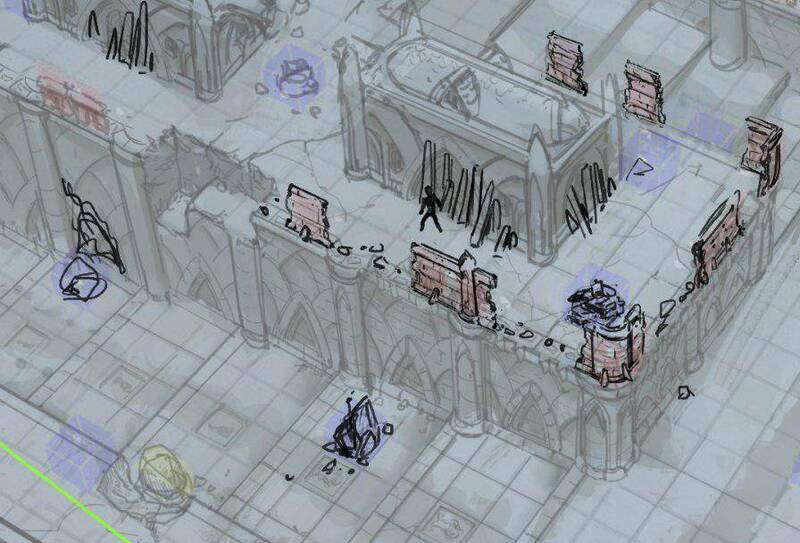 First, I wanted the opening engagement to take place in the center of a map where the player’s party will be surrounded by NPCs at an elevated position – an ambush. 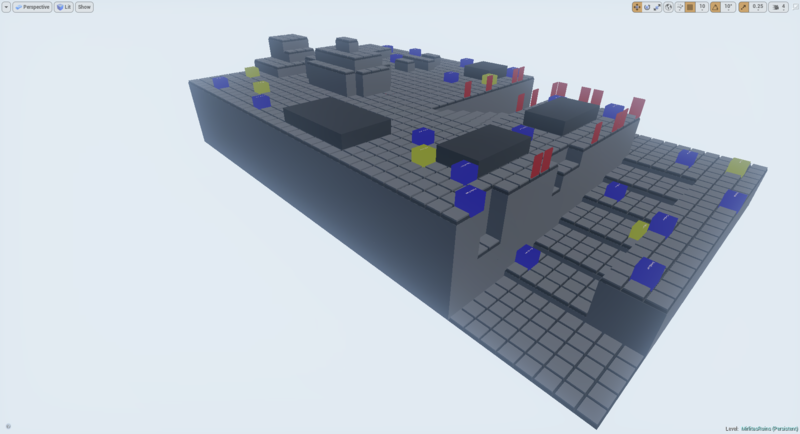 The story I had in mind gives players the option to engage in a bit of diplomacy instead of outright combat, the map had to be designed to put players in a tactically inferior starting position, but have multiple egress routes to disengage and regroup. Part of the lore I had written also pointed to an inherent weakness in the enemy forces that could help the player end the battle quickly – if they could see the right avenues of approach and had the character builds required. All this plus the need to build a assets and architecture that are unlike the rest of the maps we’ve created so far make this one of the more time intensive maps to produce. With that I’ll pass this on to Joe for a look at how he interpreted the tactical needs of the story into the map. Hi, Joe here. When I chatted with Igor regarding the map, I started to think what sort of maps would be suitable. Given the pivotal moment where the protagonist will either face a powerful enemy or gain new allies, I thought of the idea that the protagonist will have to make a pilgrimage to seek help. I immediately thought of The Seven Thousands steps on the Throat of the World in Skyrim and like the idea of pilgrimage steps. The idea is for the protagonist to walk up the steps and finally meet and talk to a faction leader on top of the stairs. Notice the area has relatively less cover and surrounded by “buildings.” Perfect for ambusher spawn points. Originally, I planned for the faction leader to stand at this platform. I envisioned the platform to be a toppled, half destroyed statue like the image below (keeping in mind the ancient grandeur Igor wanted for the ruins). Image source (https://s-media-cache-ak0.pinimg.com/originals/29/3a/aa/293aaa4ac9544ee44b9dcb9bbf556566.jpg) after some digging to find a source to credit it seems that this image is from Mortal Combat: (http://mortalkombat.wikia.com/wiki/Jade%27s_Desert ) called Jade’s Desert. I suppose they had the same idea with did with house a fight in a broken giant statue! Given the background of the factions and faction leader, I thought it would be a powerful image for the player if negotiation for the faction’s help is held while the faction leader stands on the ruins of the previous civilization. 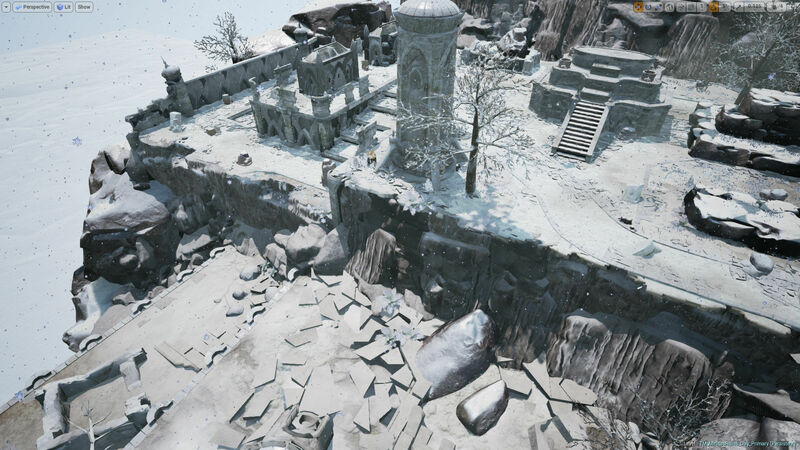 Ultimately, we decided to change the platform into another building as this map exceeds the time budget if we were to implement half destroyed statue as platform. 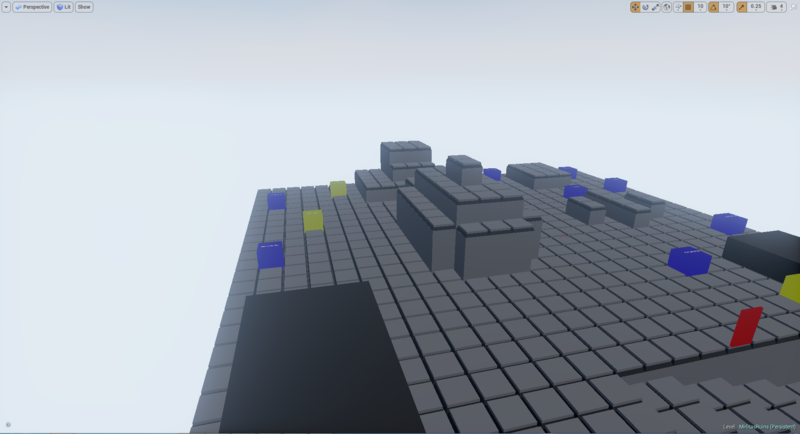 As usual, I tried to make multiple solution approaches for the map so that the player does not have to complete the scenario exactly the way that we designed it to be. One example in this map is how the player’s respond to the ambush (if ambush happens). If the player decides to retreat, then one way is to run down the stairs, drawing and taking multiple attacks by the ambushers. Or the player can try to make use of this “collapsed” section of the wall as a shortcut and jumped down instead of going through the stairs. However, the player has to charge through multiple ambusher should they chose this route. A fast but fragile party might prefer to sprint through the enemies while the slower but defensive party might prefer wider route. That’s all from my end, once Igor and I liked where the map was, we could hand then pass it on to the art side. Once the map was blocked out by Joe, the next phase was to sit down with Ken and set the environmental theme for the map. In the Forged of Blood lore, this was an ancient city and the architectural style is one that would permeate throughout the world, and what the current world’s architectural stylings are derivative of. I knew that I wanted it to be grand and ornate. Something appropriate to the architectural tendencies of powerful beings, and the style had to reflect a race that was based on a matriarchal society. Anyway, the heavy lifting then went to Ken really bring the map to life. With this map, my goal was to design a part of the city for the tactical gameplay area. 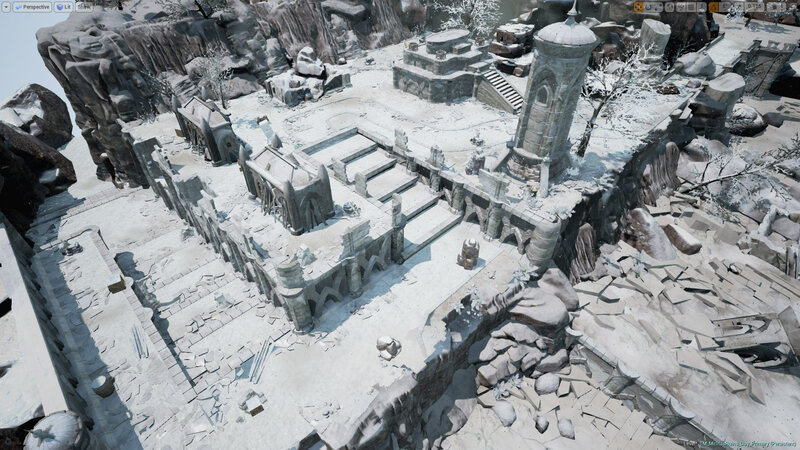 The map was designed with a huge staircase leading up to the big open area, I imagined that this could be the entrance to the city. Visitors coming from the mountain go up through the staircase where the area opens up to a big square. Of course, it’s hard to depict scale with limited resource and pre-determined greybox blocked by the game designers, so there were some liberties taken with the layout of the main square. It’s definitely going to feel more condensed than what an actual city square will look like. During my first dip into the map, I had to find reasons why the map (or this part of the city) is blocked off. There needs to be a sensible reason why the playable area is restricted. I thought maybe it could be cool visually to show that the mountain where the city is located, was starting to split and slide off, thus causing the destruction of the bridge that leads to the inner city area and also the divide between the main square area. As the mountain split and the city destroyed, the place has now become desolate and deserted. We went off with that idea. For the design of the architectural style itself, I took a lot of inspirations from gothic architectural styles with the arches and flying buttresses. Gothic architectures were supposed to reach the heavens so they are typically very tall and I think it’s very fitting because the Volgisi was the ancient civilization that was formed from all the different Volgisi clans. My goal was to make their architectural style more elegant, thus the arches and the lighter colored materials used for the buildings. Once the art was done, we passed it on to Lienny. After getting the concept art for the map, the map was divided into 3 categories, full custom assets, semi custom assets and modular pieces that will be used in different parts. The map itself has a number of specific structure designs that only appear in this particular map, so choosing the right pieces to custom make is the first thing I did to measure the total time allocation for this map. After the process is done, I began to block out the structures that are supposed to be fully custom, and then I moved on to the modular pieces first, as some of the modular pieces will still be implemented to create a semi custom piece like the walls or stairwell. Full custom pieces are reserved for the buildings structures like houses and towers, etc. In total there are 6 fully custom assets, 4 semi custom, and 40 pieces of custom modular assets. 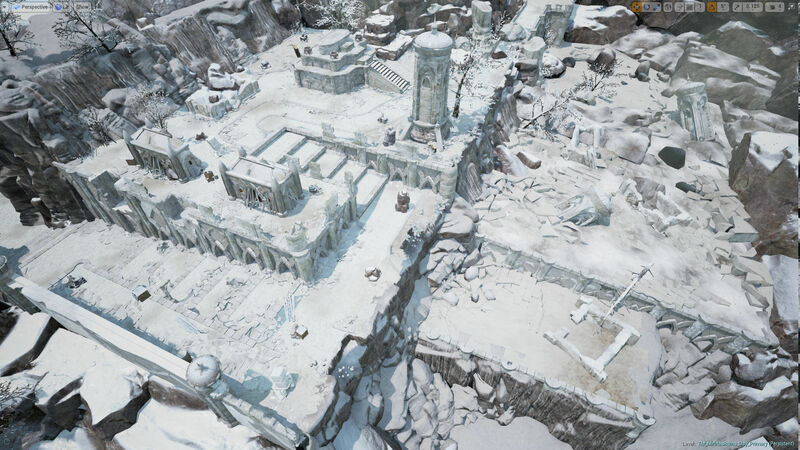 For fully customized pieces, there were some issues implementing the concept art into the map. Some of the blocked space for the structure is too small for the design, and the structure itself ended up looking like a miniature piece in the map. 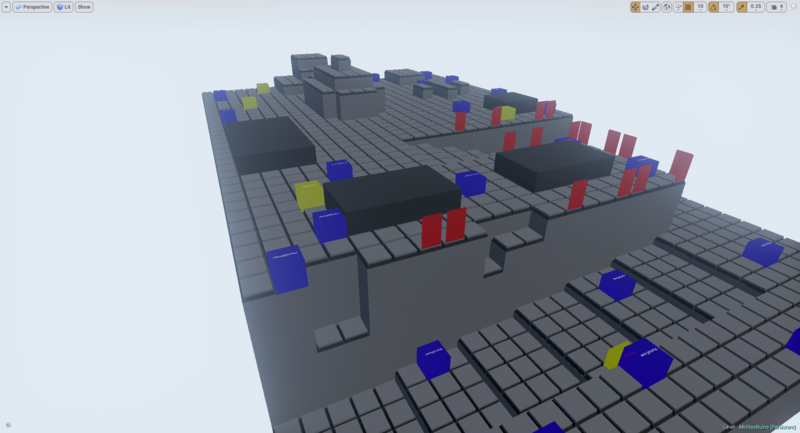 We discussed this with the level designer and ended up with increasing the blocked out space to fit the concept design. Aside issues of the game play area itself, I also need to make the “feel” of the surrounding environment, and ended up with making the whole map twice the gameplay area to reflect the surroundings, and while this is ongoing, there were also changes of covers and walls specification by the game design team – so we had to go back and redesign some of the custom cover objects. In the end, it took approximately 5 weeks to fully block out and make the asset pieces, plus additional 2-3 weeks to add further details to the map itself and getting the right ambiance. This map is one of larger scale maps that really put a dent in our production schedule, and while getting one down means we will be able to reuse some of the assets in maps with the similar look, we do try to keep these maps tied to specific engagements. This post – much like the map – took a little work from a large part of the team but the final product is pretty sweet to look at. In terms of production, we are still on track with our 2018 release, and a few of these special maps aside, our tactical map production is really picking up pace. I’ll stack a few screenshots below. 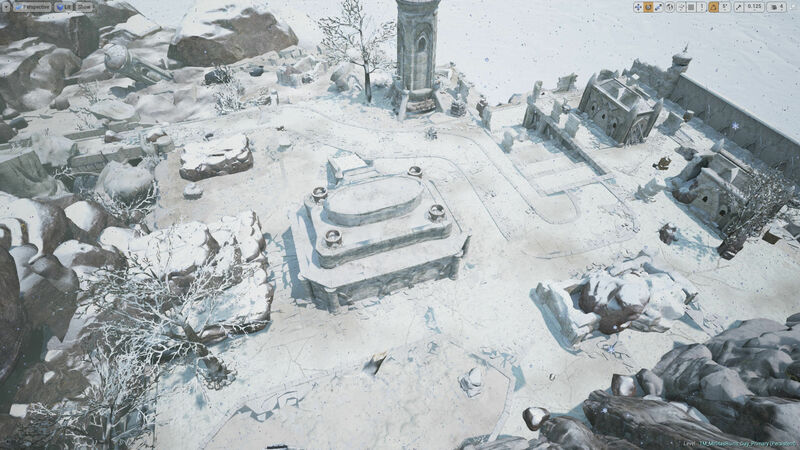 We can’t wait to start using the map for battle.